Updated for Mists of Pandaria Patch 5.4.8, with some Warlords of Draenor notes. The Survival spec is in a good place in raids and PvE in patch 5.4.8., doing slightly more damage than either Beast Mastery or Marksmanship, depending on who you ask and what sims they’re running. In addition to more effective traps (which means better control,) Survival is also effective when more magic damage is required, as opposed to physical. Warlords of Draenor is coming and there will be a number of changes. See our Hunter Changes in WoD post for info. Some notes will be added to the guide below regarding the changes that are coming. For PvP or leveling see the links just below. 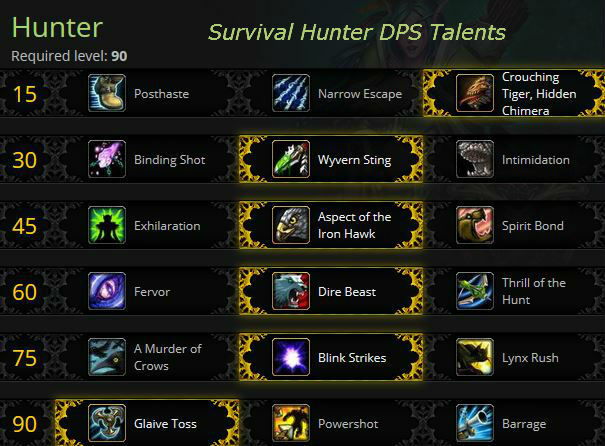 This Survival Hunter guide is primarily intended for Raiding (DPS) use at level 90. However, the principals will still apply during the leveling process. If you’re looking for advice on leveling your Hunter, check out our Hunter Leveling Guide. Talents are easily changed to suit particular situations. Makes sure you have a stack of Tome of the Clear Mind in your bags and then tweak talents and glyphs to suit particular encounters. Our picks for general use are checked: . Faster movement or more uses of Deterrence and Disengage. The latter is more generally useful, but your call. None have any direct effect on DPS. Posthaste is a maneuverability boost and is useful for getting “over there” right now. Crouching Tiger, Hidden Chimera allows us to use two of our survivability tools more often. How often do you need to use these abilities? All crowd control (CC,) none have any direct DPS value. None will have an effect on bosses. They all have their niche uses. Silencing Shot gives us the best overall utility of this tier when fighting caster mobs. Wyvern Sting is for controlling mobs that need a quick nap, even in mid-fight. It breaks on damage and does not clear bleeds and DOTs. It is a nice “wait there for a minute” for inconveniently located adds. Intimidation allows the pet to stun a trash mob for three seconds, which will also interrupt casts. Exhilaration is nice, just not quite as nice as some of the other talents in this tier. It’s better for situations where damage will come in bursts. Aspect of the Iron Hawk is the best bet for survivability. The damage mitigation will help more than either of the self heals. Spirit Bond doesn’t heal enough to be a viable choice for high damage situations, it’s more useful for leveling. In WoD: Aspect of the Iron Hawk becomes just Iron Hawk, losing the Attack Power boost. Dire is best for single target, Fervor and Thrill coming out ahead on A of E fights. Fervor is a decent DPS increase and focus gain. Nice if you can anticipate just when you will need it. Thrill of the Hunt provides free Arcane Shots and low cost Multi Shots. The focus you save can go to your other tools. All of these are very close in DPS value. A Murder of Crows gives you the greatest single target DPS increase of this tier. Recommended. Note that it’s also expensive at 60 focus. Blink Strike allows you to quickly reposition your pet. Lynx Rush is primarily useful for Beast Mastery, not so hot for Survival Hunters. In WoD: Lynx Rush is dead, being replaced with Stampede. Glaive Toss is the best pick overall, currently provides optimal DPS for single targets. The Daze that it applies can be occasionally useful. Powershot could be really good with a higher crit rating. It does knockback,which your tank might not care for. Barrage is good for those times when you have a lot of area effect fighting. These are the new talents that are coming in Warlords. Naturally they’re subject to change before release. Exotic Munitions. You can change the ammo type that you’re using and each has a different effect. Each change lasts an hour. Focusing Shot – allows you to carefully line up your perfect shot for 100% wpn damage and generates 50 focus. It also replaces Steady Shot and Cobra Shot. Lone Wolf – All of your damage is increased by 30% when you don’t have a pet active and you can provide one of several benefits to your party or raid. Any pet can be either Tenacity, Ferocity, or cunning and you can switch their specs at any time. Ferocity is generally the best choice as it provides the greatest DPS gain, but there may be situations where Tenacity or Cunning might have use. For raid buffs and useful effects see this Pet Utility Table. The buffs will determine which pet is the best one to use in any given situation. As Survival you don’t, of course, have access to the exotic pets (and their abilities,) but various other pets do bring useful abilities to the raid, beyond their damage. Looking for pets that are new and different? Petopia is probably the ultimate guide to pets. WoWhead, naturally, has a bunch of info, too. Cooldowns for pet abilities are longer than than they are in Beast Mastery and patch 5.3 doubled some pet cooldowns. Buffs do not stack with any similar buffs your team might provide, such as Cat Mastery & Shaman Mastery. Make sure you pick your pet to get the best (most complimentary) buffage possible. Here are some useful pet families. Cat – 60 second 3.5k Mastery buff. Wolf – 5% Crit buff to party. Again, this doesn’t stack. Serpent – 10% attack speed buff lasts for 2 minutes. Wind Serpent – Increases magic damage taken by the target by 5%, which is great if a lot of magic damage is being tossed about. Does not stack with similar effects. Crane – 4 second sleep, instant cast. This shares Diminishing Returns with stuns. Monkey – Gives a 4 second stun, but this has a cast time. It’s noises are also annoying to some. Spider – 5 second web root (30 yd range) that does not break on damage. In Warlords the pet abilities will change. For one, all of the CC abilities will be gone. See the changes here. Most of the Major glyphs are situational. The first pair listed are generally useful, but switch as necessary. Glyph of Animal Bond boosts the healing you and your pet receive by 10%. Glyph of Deterrence more damage reduction. Glyph of Liberation provides a small heal when you Disengage. Glyph of Disengage – a bit more distance gained. Most of the minor glyphs are cosmetic, but a few have some minor utility. None add to DPS, but Aspect of the Pack might be useful for a raid group. The revive pet glyph is probably the only important one. Glyph of Aspect of the Pack – extended range for this ability. Glyph of Revive Pet because your pet will die on occasion and you might be in trouble. This makes rezzing it easier. Glyph of Fetch – pet loots for you. Glyph of Lesser Proportion – smaller pet. Warlords: Hit and Exp will be dead. You will have a 100% chance to hit and a 3% chance to be dodged. Your pet inherits half of your Hit and Expertise ratings. But, your pet only needs Hit and gets Hit from your Expertise, so if you’re capped at 7.5% in each your pet will be Hit capped and you’re good. Crit is the “go to” stat of the rest of the stats. The more the better. Mastery adds to your magic damage, not to any physical damage you might do and nothing for your pet, so it’s not as strong as the others. Readiness is an ability gained at 90 and will reduce the cooldowns on various other abilities. Multistrike gives you a chance to gain additional free shots at greatly reduced damage. and then reforge everything else into Crit and then Haste. Reforging is dead in Warlords and even the NPCs will be disappeared. There are a bunch of changes coming in Warlords, but they won’t change your rotation much. Not unless the relative values of various abilities change. We’ll have to wait and see on that one. Improved Serpent Sting and Viper Venom have been removed. Serpent Sting has also been removed, but it’s effect is now backed into Multi-Shot and Arcane Shot. Serpent Spread has been renamed Serpent Sting and remains as a passive ability for Survival Hunters. It causes Multi-Shot and Arcane Shot to also apply the Serpent Sting poison, which does instant and periodic damage. Kill Shot is no longer available to Survival Hunters. BM and MM can still use it. Your Lock and Load‘s effects have been incorporated into Black Arrow and have been redesigned. Lock and Load now causes the next Explosive Shot to not trigger its cooldown, but no longer causes it to be free or reset the ability’s current cooldown. This effect can stack up to 5 times. Black Arrow deals 60% more damage, inflicts Shadow damage every 3 seconds, and triggers Lock and Load on Multistrike hits. Aspect of the Hawk (or the talent Aspect of the Iron Hawk) should always active, save for when an encounter requires a great deal of movement in which case Aspect of the Cheetah may prove to be a superior choice. Keep Hunter’s Mark and Serpent Sting applied to your target at all times. Serpent Sting should be refreshed by your Cobra Shot making it unnecessary for you to re-apply it directly the majority of the time. Use Explosive Shot on cooldown as well as whenever Lock and Load procs granting you two shots without focus cost or cooldown. Cast Black Arrow on cooldown. Start using Kill Shot when your target reaches 20% health. Use Arcane Shot to expend excess focus, but never completely use up your focus as you’ll need it for the above abilities. Cast Cobra Shot to build focus and refresh the duration of Serpent Sting. Explosive Trap instead of Black Arrow only if you can hit multiple targets at once with Explosive Trap. Switch to using Multi-Shot instead of Arcane Shot as your focus dump. Cast Explosive Shot on multiple targets whenever Lock and Load procs to maximize DPS. Multi-Shot as your primary damaging attack in addition to using Explosive Trap. Kill Shot should be used when a target drops to 20% or below health. Your DPS cooldowns Dire Beast, A Murder of Crows, Rapid Fire, Rabid and Stampede should be used on cooldown. There seems to be very little difference in priority between them, so use them as they pop up. In Mists of Pandaria Agility is definitely your best stat, but gems with secondary stats have twice the value of agility gems, 320 Haste Vs 160 Agility, for example. This means that socket matching will be worthwhile in some cases, particularly if the slot has a big agility bonus, say 60+ agility per slot. Use this tool if you want to really maximize your gem usage. It will factor in race, all your gear, various other stuff, and help min-max for your particular situation. Really quick and dirty answer? Just gem for Agility in all slots. Meta socket: If you can get the Capacitive Primal Diamond then go for it. Otherwise the Agile Primal Diamond will do until you can get the other. Note that if the socket bonus is something other than Ag or Crit you’re probably better off just dropping a Delicate Primordial Ruby into those yellow and blue sockets. Various other gems are included below in case you want to experiment. Short on gold? Most of the enchants below have similar enchants available, of lesser value, for less cash. We’ve linked to a couple of these. Check with the rep vendor or the Auction House for others. If you want to buy the best enchants, fund all of your alts, donate to the guild, etc., but don’t have the cash, then see what the Tycoon Addon can do about about improving your situation. Meta Capacitive Primal Diamond: +324 Critical Strike, and chance on melee or ranged hit to gain Capacitance. Requires the legendary quest line. A cloak enchant will add Hit and the glove enchant will add Expertise, if you need to top those off. Ranged Weapon Lord Blastington’s Scope of Doom: Sometimes add 1,800 Ag for 10 seconds. Bracers Fur Lining, Agility: +500 Agility, requires Leatherworking. In Warlordsall of the combat bonuses from all of the professions will be removed. The professions will be for fun and/or gold making. Most of the professions add an average of about 320 Agility. Since gems with secondary stats are twice the value of those with primary stats (320 Haste Vs 160 Agility, for example) Blacksmithing might be the most valuable profession if you’re just looking for the buffs or gemming versatility since you can add the 640 in stats vs 320 Agility. Jewelcrafting provides only 320 in any stat over non JC gems. Engineering has a big Agility cooldown and Herbalism has a very nice Haste cooldown. Which profs are “the best?” Engineering for the cooldown and the various useful toys. Blacksmithing for the extra gem sockets, but since you’ll just drop Ag gems into those it’s no better than the other profs. Leatherworking Bracer enchant adds 500 Ag. Enchanting Enchant both rings, for a total +320 Ag gain. Inscription Shoulder enchant adds 520 Ag and 100 crit. Blacksmithing gives two extra gems slots. Since gems with secondary stats have twice the value of gems with primary stats Blacksmithing might be a very valuable profession. For example, you’ll be able to socket the two gems for 640 PvP Power instead of 320 Ag. Herbalism Small heal and 2880 Haste for 20 seconds, plus you find Spirits that heal you. 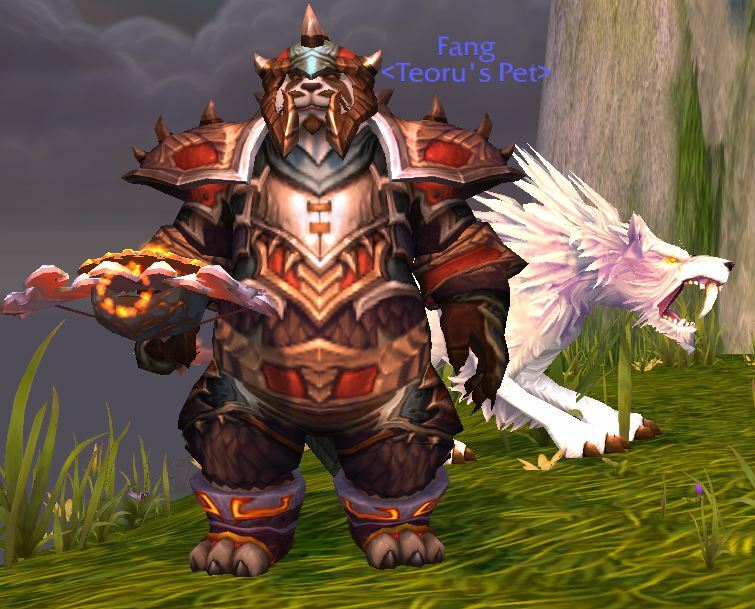 Pandarens get doubled food buffs. In Mists of Pandaria even Pandarens can become Hunters, but not Gnomes. Hit and Expertise are gone, and so are any racials than have anything to do with those two stats. There are other racial changes, see them all on our race changes in WoD post. Horde Damage: Orc (Blood Fury) and +5% pet damage ; Troll gets Berserking and Bow crit. Goblins get a Haste effect and Rocket Jump (a useful escape ability.) Undead drain life and heal. Pandarens (Mists of Pandaria) can be either Alliance or Horde, they choose when they leave their starting area. They can put enemies to sleep with a touch of the paw, but youi don’t want to be in melee range. Increased benefits from food buffs will be quite nice while raiding. Double Rest XP (from Inns) makes for faster leveling. A decent DPS gain: +1% hit is nice for any Hunter and your pet get’s half of that. A small HoT, Gift of the Naaru, will help with survivability. WoD: The Hit racial is dead, instead you Ag will be increased. If Ag turns out to be as valuable in WoD as it is in Mists then this might turn out to be the best racial. A DPS gain is their 1% increased chance to crit, which is a good stat for you, and …. Worgen can “periodically move more quickly,” which definitely has it’s uses. A DPS gain: Dwarves get expertise with ranged weapons which is useful. The stone form ability is rather nice, washing away bleeds and reducing damage taken by 10%, and the latter part of that will find occasional PvE use. WoD: Ranged expertise is dead, StoneForm is improved. Shadowmeld drops aggro in PvE encounters, but it’s redundant with your Feign Death ability. It does not add to your Camouflage ability. Night Elf hunters also gain the benefit of a 2% dodge chance increase, another bonus to stack with Aspect of the Monkey when forced into melee. This willonly rarely be of any use to you in PvE. WoD: 2% greater movement speed. Touch of Elune adds 1% Crit by day and Haste by night. They have nothing that’s specifically useful for DPS, though their escape ability is quite nice for PvP and occasionally of use in PvE. Their diplomacy ability will help with the rep gains with the many factions of Azeroth and beyond. Their expertise with melee weapons is of no use to you. Increased Spirit is not useful. Trolls are possibly the best of all the races for Hunters. Trolls possess the Berserking racial, a potent DPS increase for those burst phases. Stick it into a macro. Trolls get Ranged weapon expertise, which is pretty nice for you. Trolls also get +5% damage bonus Vs. beasts. Some of the trash mobs found in PvE content count as beasts, so this will be occasionally useful. A somewhat more situational ability is the reduced duration Trolls get from movement reducing effects. and a 15% resistance to all stuns with Hardiness, useful in PvP situations and helpful in rare PvE content. WoD: Blood Fury and Hardiness are both nerfed. Undead can drain life from opponents and be healed for the same amount. This is a passive effect and happens occasionally with your damaging attacks. it will add a bit to your DPS numbers. “Will of the Forsaken” can wipe off sleeps, charms, etc., a nice ability to have, especially in PvP and occasionally in PvE. WoD: And old ability, Underwater Breathing, returns and is improved. Rocket Jump has definite uses at times, especially as “gain range” ability when Disengage is on cooldown. An increase in Alchemy skill, along with a greater effect from your own healing potions, is also nice. The Blood Elves are a a rather “meh…” race, as far as Hunters are concerned. Their big ability is Arcane Torrent, which can be used as an AoE silence/interruption when forced into melee range with caster classes. Paladins and Death Knights, for example. Ideally Hunters want to avoid “melee range” like the plague. WoD: Belves will have an added 1% Crit. Tauren are another generally viable Hunter race, gaining a 5% bonus to health that is occasionally useful, though it doesn’t scale well at high levels. You’ll also gain the benefit of Warstomp, an AoE stun that may allow you to gain range from the opposition. Herbalism provides a nice little heal and a Haste effect, both of which are nice for Hunters and the Tauren’s increased Herbalism skill will get you into that heal just that much faster. A slightly crazed Hunter DPSing in dungeons. Lots of chat and some good tips. In this one the author covers talents, glyphs, gems & enchants, and rotations. Once upon a time, while leveling, you had to look up quest details on some website. Now you have a guide like Dugi’s which sits in-game, in a small window, and shows you step-by-step where to go, what to do, and a number of details to make it even easier. WoW’s in-game quest helper is great for showing where the quests are, but it doesn’t show you the best order in which to do them and it doesn’t show you which ones are best and which should be skipped. Dugi’s does. 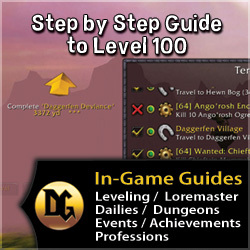 Why a guide when you can just buy a level 90 for $60 from Bliz? Save money, for one. For another there’s the extra gold, rep, learning your character, etc. And you still have to hit those last ten levels. Dugi’s in-game guide is always quickly updated for all patches and expansions, so it’s never obsolete. Grab yours here and get leveled fast. It might, for working out why one’s DPS might not be up to spec. It gives you an ideal for a particular type of fight (Patchwerk) and if your DPS is significantly lower then tweaking your rotation might be a good idea.